Finding an emergency dentist in an urgent situation can often be stressful. This guide is to help you understand the difference between a routine dental appointment and dental emergency and to help you find a dentist near you which may be able to help. There are a range of websites which can help with finding an emergency dentist near you including the NHS Emergency dentists. 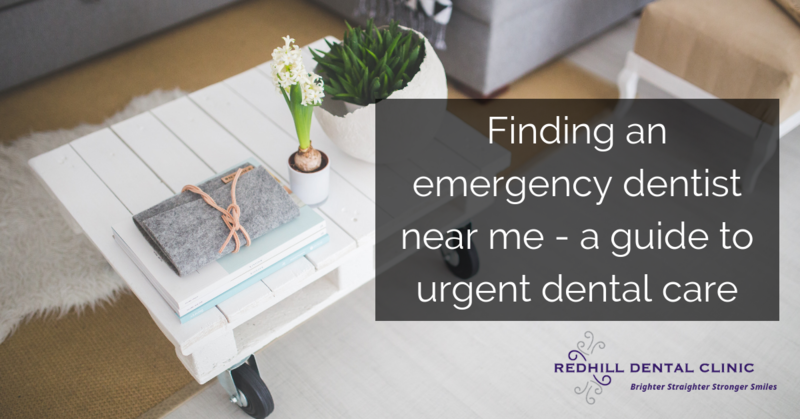 The best way to ensure you have access to an emergency dentist is to ensure you are registered at a local dental practice at all times, this then makes finding treatment in urgent situations much quicker and easier, however the links above should help you in your search. Are in extreme dental pain. Have chipped tooth and are in extreme pain. Have chipped tooth and you have blood coming from the tooth itself (not necessarily around the tooth). Have sudden and painful swelling in and around your jaw or tooth. You have chipped the tooth and there is no severe pain or bleeding. A dental crown has come loose and you don’t have extreme pain. You have knocked a tooth and you have been minor bleeding from around the tooth socket. If you have severe bleeding and/or bleeding from the chipped tooth itself then this is an emergency. If any of the above are true then you should make an appointment with your dentist at the earliest convenience. Severe tooth trauma where a tooth has been avulsed (knocked out). A dental abscess which appeared suddenly, this can either be on the gum (which you will see) or at the base of the tooth (which you may not see but will definitely feel). Extreme pain on biting, this can sometimes be linked to a cracked tooth or infection. Painful inflammation around an individual to. If the answer to either question above is yes, then emergency dental care should usually be sought. Attempt to stop the bleeding by getting the patient to bite down gently on some sterile gauze. Biting down on a used teabag can also help as the tannin in the tea has been shown to help control bleeding. Ensure the head is tipped forwards so that any excess blood drained out of the mouth and is not swallowed. If the tooth that has been knocked out this whole pick it up by the Crown (the part of the tooth which you can see). If the knocked out tooth is whole and you are able to see which way round it goes then gently place it back into the socket if possible. Place the knocked out tooth into a clean plastic bag and fill with milk if available. Contact an emergency dentist or take the patient to your local accident and emergency department. If the dental emergency is due to severe pain then over the counter painkillers may help. You may also find that a cold pack applied on the outside of your cheek around where the pain is can help manage pain if it is localised to one particular area. Rinsing with warm salt water can also help alleviate dental pain. Cloves have also been shown to have anti-inflammatory and antibacterial properties which can help manage sudden tooth pain and gum infections. Soaking a small cotton ball with clove oil and applying to the affected area may help. How does the dentist treat emergencies? A dentist will always undertake emergency dental treatment to treat the pain and bleeding first, after this it can move on to restorative treatments, depending upon what the initial problem was. Tooth loss or extraction can be treated with a dental bridge or dental implant. Loss of a dental crown can be replaced either with a new crown or have the old crown fitted again. A dental abscess can be treated with root canal treatments. Your dentist will also give medication such as antibiotics to treat any infection. If you’re looking for an emergency dental practice or dentist in Stourbridge then please contact Dr Phil McDermott, your local friendly dentist; details of emergency appointments are always available on the practice answerphone even outside of normal working hours . ‹ What happens at the dental hygienist?